Prepare for Halloween with this theme'it teaches children everything they need to know to be safe on Halloween night! Educatall team suggests an imaginary game you can enjoy with your group. (Open thematic letter - Halloween Safety) Print the letter. Prepare a colourful envelope. Leave it in an easy to find location within the daycare. During circle time, invite children to find it and read portions of the letter to them each day. Use the pictures as a memory game or to spark a conversation with the group. You may also use them to decorate your daycare or a thematic corner. (Open picture game - Halloween Safety) Print, laminate, and store in a "Ziploc" bag or in your thematic bin. Small houses, a garage, and figurines which can represent the neighbourhood children will visit on Halloween night. Play mat representing a town with streets. If you do not have a play mat, make your own streets using colorful electrical tape on the floor. Children will love driving around their very own streets. Pre-cut various traffic sign shapes out of orange and black construction paper. 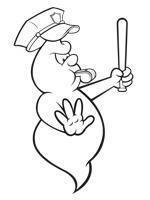 Invite children to create their own signs representing a Halloween safety rule (see list on educatall). Explore anything fluorescent! Make posters on fluorescent pieces of cardboard to represent Halloween-related items. Ask children to make their own traffic lights. Provide a model. Using a brown paper grocery bag, have children make their own trick or treat bags. They will be very creative! As a group, prepare a model representing a neighbourhood. Use recycled material and repeat safety rules over and over again! Coloring pages which represent means of transportation, traffic signs, pedestrians crossing the street, etc. A reflective vest and a stop sign are perfect for pretending to be crossing guards. Use electrical tape to create a "street" within the daycare. Display traffic signs on the wall. Face paint can be used. Explain how make-up is safer than wearing a mask. 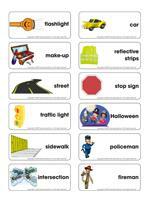 Memory game involving means of transportation and traffic signs (see educatall). Store-bought versions may also be used. 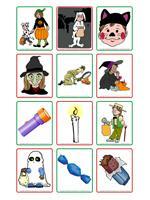 Halloween memory game with illustrations relating to safety rules. Laminated pumpkins. Punch holes around the contour and encourage children to lace them with fluorescent shoelaces. Orange, black, purple, and green modeling dough. Provide cookie cutters with geometric shapes. Children can create their own traffic signs. Flashlights can be used to read in the dark. Tracing and maze games involving "streets". An obstacle course through which children must search for hidden traffic signs or candy. Have children respect safety rules while having fun. Play "The witch says". Have children act out safety rules. (Open picture clue story - Halloween Safety) Print. Sit in a circle with your group. Begin reading the story. Pause for each picture clue. Point to the clue and have children guess the missing word. Children sit in a circle. Place various objects (or illustrations) which are either safe or unsafe for Halloween in the center of the circle. Some examples of items may be a flashlight, make-up, a mask, reflective strips, etc. To the sound of music, children pass a small object like a miniature pumpkin around the circle. When the music stops, the child holding the pumpkin must select an item which is safe from the center of the circle. Turn all the lights off and turn on your flashlights. To the sound of music, children dance around the daycare, making their flashlights dance on the walls and on the floor. Designate one child to be the vampire. Have him wear a cape and try to capture one of his friends. When he succeeds, the child who was captured becomes the vampire. Trace a street on the ground. Use three cardboard circles: red, green, and yellow. Children walk along the street you created and must respect safety rules. When you display the green circle, they must walk quickly. They must walk slowly when the yellow one is displayed and stop when the circle is red. (Open memo - Safety identification) Print and have each child choose one identification memo. Have children color their memos and bring them home so they can complete the information with their parents. Have them bring their memos back. Laminate them and attach a string so they may wear them around their neck on Halloween night. (Open association game - Halloween Safety) Print and laminate. With Velcro, children associate the safe or unsafe illustrations to the correct picture. (Open Halloween safety rules) Print, cut out, and laminate the safety rules. Deposit them in a plastic pumpkin. Pick one rule at a time and ask children to explain it. Discuss each rule thoroughly. Tell children why it is important to respect each rule and the consequences each rule avoids. Enter the daycare wearing a costume. Children must identify what is safe and unsafe about your costume. (Open picture game - Halloween Safety) Deposit a red piece of construction paper and a green piece of construction paper on the table. Print and cut out the safety rules. Children must place the illustrations on the green paper if they represent correct behaviour and on the red paper if they represent incorrect behaviour. Print a surprise picture and glue it on heavy cardboard. Cut various pieces to make a puzzle. Place the puzzle pieces inside a plastic pumpkin. Sit around the table and ask children various questions about Halloween safety. When they provide the correct answer, have them pick a puzzle piece and place it on the table. Once they have found all the correct answers, they will hav e all the puzzle pieces. They can discover the surprise picture. Deposit a box containing an illustration in each corner of the daycare. Send a child to each corner to look in the boxes. Children then take turns describing what they saw to the rest of the group. They must identify whether what they saw represented a danger or not. Place four new illustrations in the boxes and start the game over again. You may use the illustrations form the picture game. Use a large box (like an appliance box) so there will be enough room for the entire group. Show children the box and find a way, as a group, to transform the box to make it look like a fire truck. Collect red objects and put them in the fire truck. This project can last the entire week. 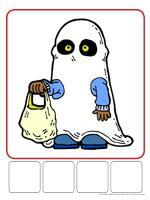 (Open story and memory game - Halloween Safety) Print, cut out, and laminate the illustrations. Place the illustrations face down on the floor. Children pick three illustrations and invent a story. Variation: Glue the illustrations to the top of frozen juice cans. Use as a memory game. Write short sentences on little pieces of paper (example: I look both ways before crossing the street, I hold an adult's hand, I walk, etc.) Deposit them in a bowl. Children take turns picking a piece of paper. Read the sentence for them and have them act it out. The other children must guess the safety rule. The first child to guess correctly is the next player. Provide Halloween make-up. Let children explore. They may paint their own faces or paint a friend's face. Take pictures and show parents the result! Make gingerbread men. For the occasion, they will represent pedestrians at crosswalks. (Open scrapbook) Print several copies of each page and have children color them. Take pictures of children and add copies to each of their scrapbooks. Add personalized comments. Glue the cover page onto cardboard and join the pages together using ribbon or add to a binder for each child. Print this new scrapbook page for each child. (Open scrapbook - Halloween) Add the page to each child's scrapbook. (Open model - magnifying glass) Print for each child. Use a piece of cardboard for the handle and acetate paper for the glass. Children may use their magnifying glass to examine candy. Use red, yellow, and green Jell-O powder. Pour it into separate containers and add a small quantity of water to each. Let children paint freely on waxed paper using the Jell-O mixture. The colors represent traffic lights. 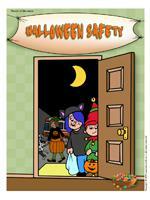 (Open creative coloring - Halloween safety) Print for each child. Have them complete the drawing by adding what they see with their flashlight.